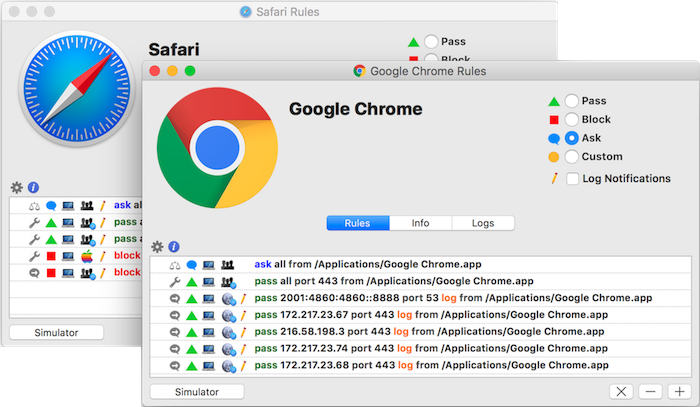 Vallum is a little tool that helps you monitoring applications connections. It is able to intercept apps connections and hold them while you decide whether to pass or block them. It can be used to increase your privacy or to transparently protect non-admin users from unwanted connections on multi-user macs. Vallum simple interface can be used by everybody to configure the firewall, its default configuration is not intrusive and it does not require any interaction or specific knowledge or maintenance. Simply drag an app icon from the Finder into main Vallum window to block it. To change Vallum attitude and interaction level you just have to play with the very few options available. Just run Vallum Assistant to explore Vallum features. 15-day money back guarantee, if you’re not happy you’ll get a full refund. Try before you buy! You can evaluate Vallum trial for an unlimited period of time. non-commercial license allows you to install Vallum on up to a maximum of two computers per person at a time, for up to a maximum of five persons sharing the same household. Vallum is signed. SHA256 checksum is also available. Interested in testing the upcoming new Vallum release? Nightly builds are often available here. Don’t forget to join our support forum! There you can share your experiences, opinions and talk with the developers of Vallum and Murus. 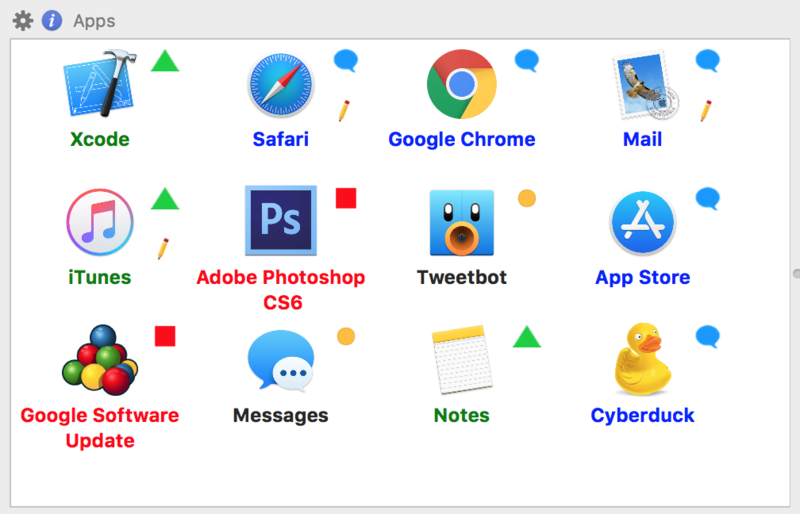 Drag and drop apps or folders icons from the macOS Finder to Vallum in order to block them. Rules are immediately active, and are persistent across system restarts. Interaction with Vallum is now even easier with a simplified notification window and simplified configuration Assistant. Create your own ruleset in a few minutes with the maximum flexibility and freedom. Each app and folder features its own set of firewall rules, including custom rules. The afw firewall core allows you define rules just like pf, using the same logic and a very similar syntax. Run the Assistant to configure Vallum step by step. Restart it at any time to reconfigure your firewall from scratch. Configuration is done simply using buttons and controls, there’s no need to learn or type code or remember rule syntax. Rules are easy to identify and understand, and the Simulator allows you to test apps connections to verify your ruleset. Creating, editing, moving, copy/pasting objects is now much more easier with Vallum 3. And even configuring custom rulesets is now easier using app editor’s templates. Vallum 3 adds groups management. Groups are addresses containers and are translated into runtime afw tables, which are very similar to pf tables. With Vallum 3 you can create rules targeting specific groups, including nations, allowing you to create geo-ip blocks at application layer. Geoip data is directly sourced from RIR databases. The afw firewall core allows you to choose which connections you want to log. 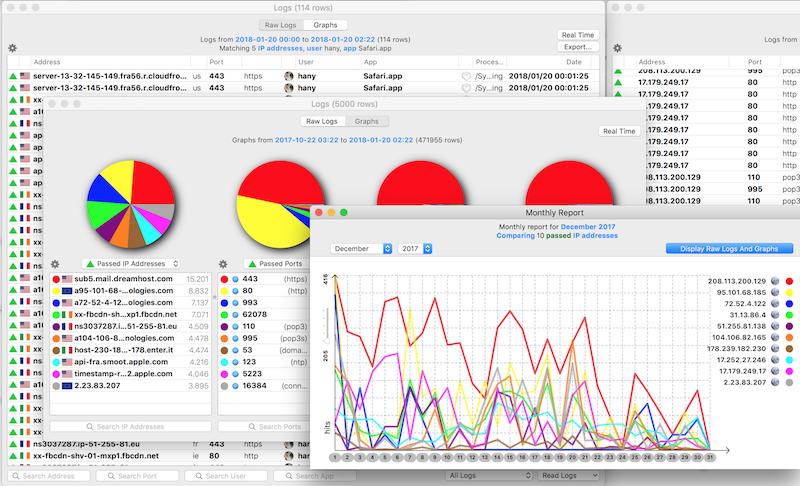 Vallum is able to search and display raw logs, perform multi-level recursive queries, pie-chart graphs, monthly/daily graphic reports comparing or aggregating different items. You will be able to search a 5 millions rows logs database and find what you are looking for in a few seconds. Its powerful logging system will drive you to the relevant part of the information you are looking for, and being based on SQLite your logs can be analysed using third party tools or scripts. The administrator can assign specific rules to each user. This can be done very easily using Vallum User Management, where you can constrain (or give privileges) to your local users. There you can also schedule user rules, so for example you can block a user only on specific time/day. Non-admin users can be further constrained preventing them from being able to modify the firewall or even to see it. Interaction can be constrained too, and normal user can be forced to use simplified notifications and/or answer using fixed-time temporary rules. Vallum 3 is based on afw, a socket filter application firewall for macOS. We developed afw to be as much similar to pf as possible, including last-matching-rule policy, quick flag, runtime tables. Vallum installs also the afwctl shell front end that can be used by expert users to manage afw from the shell terminal. Vallum 3 documentation includes afw man pages. afw can also be installed as a standalone product and used without Vallum. afw is Free. Click here to download afw installer. Is Vallum 3 a free upgrade for existing Vallum users? Yes, Vallum 3 is a free upgrade for all Vallum 1 and Vallum 2 users. How to upgrade from Vallum 2? Vallum 3 is not compatible with previous versions of Vallum. It is based on a new core and architecture, it uses different logic and structures. Please uninstall Vallum 2 before installing Vallum 3. Is it possible to migrate a Vallum 2 configuration to Vallum 3? No, it is not possible. Vallum 3 is based on a totally different core and logic. How does Vallum play with other firewalls? The macOS built-in firewall can be activated from System Preferences to block inbound connections. 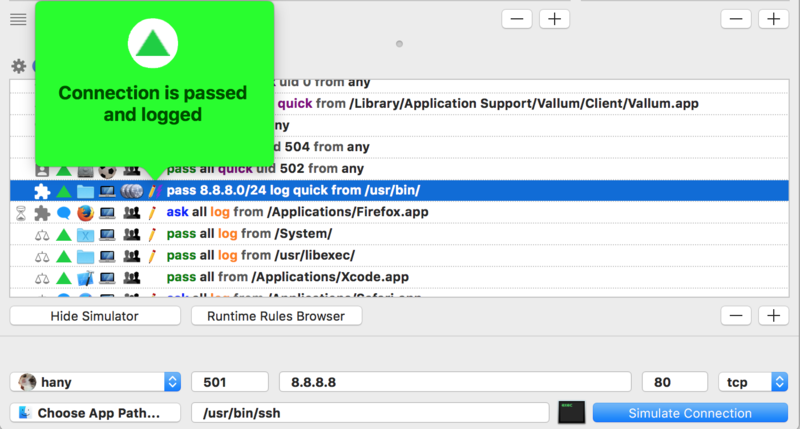 Vallum adds the ability to block outbound connections, so it is the perfect companion for the macOS firewall and they can be used together. 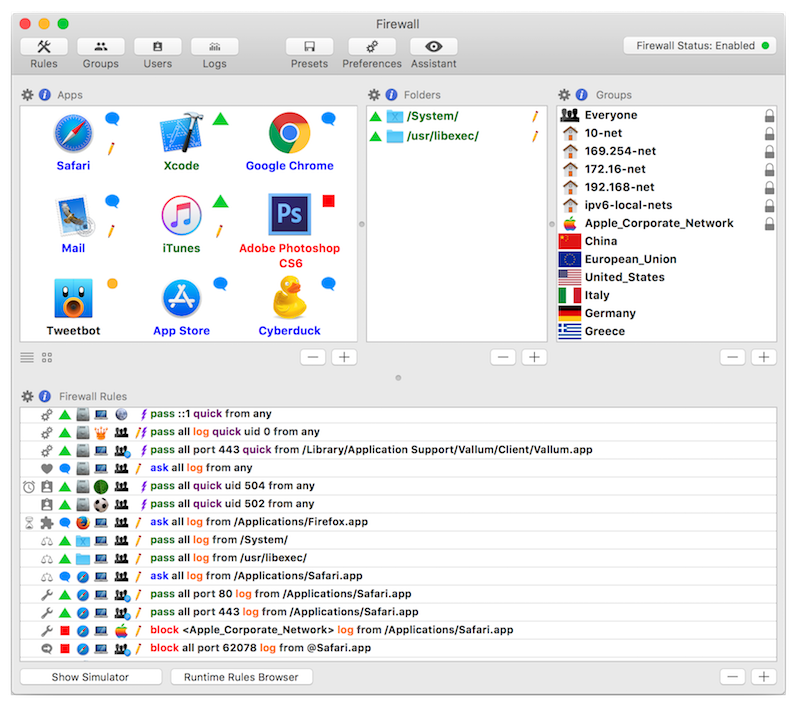 Additionally, the macOS built-in pf network-layer firewall can be activated to provide even more security to your Mac. This can be done manually from the shell terminal or using Murus, which is designed to work with Vallum. How can I start/stop Vallum? Vallum is automatically started when you power on your Mac. It works in background and, while your are logged in, can be controlled using an icon on the macOS menu bar, near the clock. You can at any time enable or disable the firewall with a mouse click. Just run Vallum Uninstaller to completely remove Vallum from your Mac. 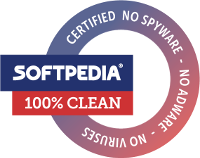 Vallum Uninstaller is included in Vallum package. Additionally, Vallum documentation lists all files installed by Vallum on your Mac. What’s new since Vallum 2? Why Vallum? What does this name mean? Vallum is the latin word for “wall”, “sieve” or “rampart”. Latin is the ancient language of our homeland.